This article is about the official language of Malaysia. 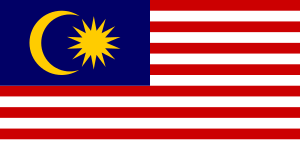 For an overview of all languages used in Malaysia, see Languages of Malaysia. Spoken by the vast majority of those in Malaysia, although most learn a local Malay dialect or other language first. The Malaysian language (Malay: Bahasa Malaysia), or Standard Malay is the name regularly applied to the Malay language used in Malaysia. Constitutionally, however, the official language of Malaysia is Malay, but the government from time to time refers to it as Malaysian. Malaysian is a standardised register of the Johore-Riau dialect of Malay. It is over 80% cognate with Indonesian. It is spoken by much of the Malaysian population as a second language. It is a compulsory subject in primary and secondary school. The Malaysian name for the language is Bahasa Malaysia (literally "the language of Malaysia"). This term is occasionally found in English. Article 152 of the Federation designates Malay as the official language. Between 1986 and 2007, the official term Bahasa Malaysia was replaced by "Bahasa Melayu". Today, to recognise that Malaysia is composed of many ethnic groups (and not only the ethnic Malays), the term Bahasa Malaysia has once again become the government's preferred designation for the "Bahasa Kebangsaan" (National Language) and the "Bahasa Persatuan/Pemersatu" (unifying language/lingua franca). The language is sometimes simply referred to as Bahasa or BM. The Malaysian language is normally written using a Latin alphabet called Rumi, though an Arabic alphabet called Jawi also exists. Rumi is official while efforts are currently being undertaken to preserve Jawi script and to revive its use in Malaysia. The Latin alphabet, however, is still the most commonly used script in Malaysia, both for official and informal purposes. The Malaysian language became the sole official language in West Malaysia in 1968, and in East Malaysia gradually from 1973. English continues, however, to be widely used in professional and commercial fields and in the superior courts. Other minority languages such as Kadazan, Thai, Iban, Bengali, Kristang, Gujarati, Telugu, Malayalam, Punjabi, Tamil, Sindhi, Foochow, Mandarin, Cantonese, Hokkien, Hakka, Teochew, Hainanese, Murut, Bajau, Dusun, Senoi are also commonly used by the country's ethnic Chinese, Indian, Sabahan/Sarawakian Natives, Thai, Eurasian/Kristang and Orang Asli minorities in order to preserve their heritage although they are citizens of the Malaysian nation. The Malaysian language has most of its words borrowed from Sanskrit, Tamil, Hindi, Persian, Portuguese, Dutch, certain Chinese dialects, Arabic and more recently, English (in particular many scientific and technological terms). Modern Malaysian is also heavily influenced by Indonesian, largely through the popularity of Indonesian dramas, soap operas, songs, and other music. Malay modern vocabulary, which may not be familiar to the older generation, such as awek (girl), balak (guy) or cun (pretty). New plural pronouns have also been formed out of the original pronouns and the word orang (person), such as kitorang (kita + orang, the exclusive "we", in place of kami) or diorang (dia + orang, "they"). Code-switching between English and Malaysian and the use of novel loanwords is widespread, forming Bahasa Rojak. Consequently, this phenomenon has raised the displeasure of language purists in Malaysia, in their effort to uphold the proper use of the national language. ↑ Hammarström, Harald; Forkel, Robert; Haspelmath, Martin; Bank, Sebastian, eds. (2016). "Standard Malay". Glottolog 2.7. Jena: Max Planck Institute for the Science of Human History. ↑ Back to Bahasa Malaysia. Thestar.com.my (4 June 2007). Retrieved on 19 October 2010. ↑ Sneddon, James N. "The Indonesian Language: its history and role in modern society". For a list of words relating to Malaysian language, see the Malaysian language category of words in Wiktionary, the free dictionary.